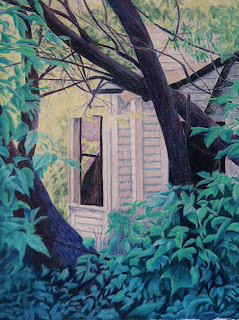 The weather has been very nice but I did finally finish "Bay Window". It is now pinned to the wall for review. Maybe it will be matted next year. 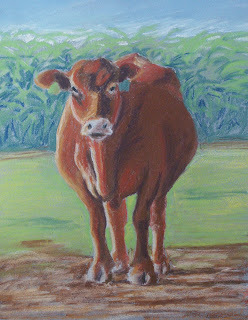 As a change of pace I did a small pastel of a red cow. I took the photo last Saturday. The glorious weather has made all of the colors, particularly the greens, brilliant and glowing. Wow I love both your paintings but the bay window I could look at for hours! I really appreciate your input! Do you garden? We have a watergarden (see a previous page) that gets lots of attention during the summer.